Over the past three years that I’ve been pursuing children’s illustration, I have experienced what is likely normal for one new to the field; a lack of focus and direction in my work. When trying to find my voice, I’ve been scattered stylistically, drawing certain ways because I can, but not because I should. Since starting out, I have been working steadily at reining in my hand, and being much more intentional in the way that I draw. consider drawing your characters with a classic, and less cartoony, approach. Important lesson: Don’t put a single piece in your book that you feel even the least bit iffy about. Note that the new portfolio has less work than the old one (12 pieces vs. 17). Last year’s portfolio displayed a range of my ability, yet reflects a more scattered sense of the kind of work I do (simply because I was scattered in my understanding of what I should do). The mentorship program helped me gain that focus towards one cohesive look and, even with two styles, I feel the new portfolio has achieved that unity. 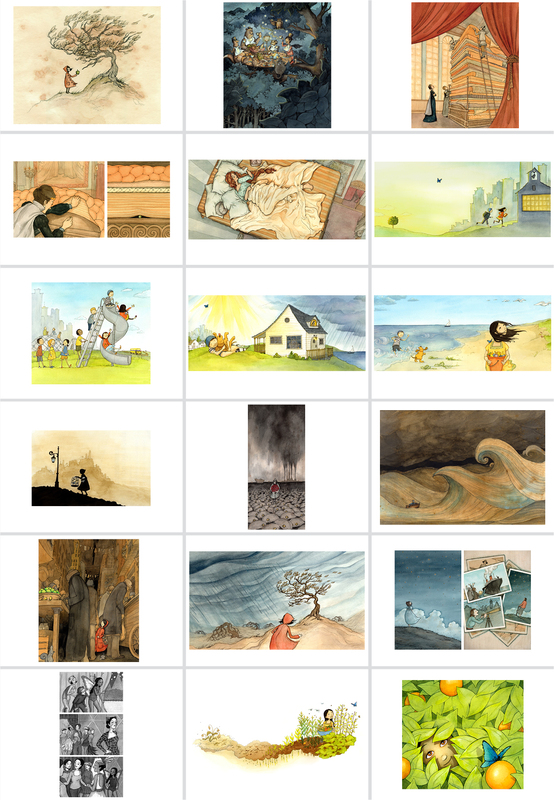 My thanks go out to SCBWI for creating this mentorship program, and to the judges of this year’s showcase (Laurent Linn, Steven Malk, Richard Jesse Watson, Nancy Conescu and Jamie Weiss Chilton) for choosing my work out of such a big pool of talented illustrators. Most of all I thank my mentors (Pat Cummings, Cecilia Yung, Priscilla Burris, Bridget Strevens-Marzo, David Diaz, and Rubin Pfeffer), who shared their advice so openly and generously. I owe my win at this year’s Portfolio Showcase to them! If you have any comments to add or follow-up questions about specifics I might not have covered, I would love to hear them. Thanks for your interest! This is such a great post. I can see so clearly how you made a shift in what you were doing and how easy it would have been to shift too far and miss the mark. I’ve been illustrating in other markets a long time, but only seriously working on a children’s portfolio for the last two. Your post gives me hope! Thank you Kristen, I’m so glad you found it helpful for your own work. As you said, I could have shifted one way or the other, and I think I just needed to hear that there WAS a place for the work I like doing – more traditional, old-fashioned, and dark work. There is a place for any style, you just have to connect with the right people looking for it. Good luck on your portfolio! Other than that, good post. Thanks for the comment Sarah. Lisbeth’s “Wizard of Oz” piece is my favorite illustration of all time, so it was a little bit of an homage to her. Maybe though, it would be more appropriate to have the flowers be something other than poppies, which would differentiate it more. Something I’ll have to consider. Very helpful, concise explanation, Eliza. I’m sure lots of illustrators will get a lot out of it. I know I did. Thanks! You’re welcome Dana, and thanks for reading! “• consider drawing your characters with a classic, and less cartoony, approach”. For what it’s worth I’ve been illustrating children’s books for over 20 years and I’ve heard that comment a time or two. My style has evolved over the years but I knew I would never be comfortable illustrating in a “classic style” so instead I found a market that supported the style I do best… Cartoony. Anyhow just wanted to say your art is fantastic and keep up the great work. It’s so important to draw the way that you love! Good for you for finding that market. I do believe there’s a need for every style. In my case, I just needed the permission to go classic all the way, often hearing that “old fashioned” was a bad thing, not edgy enough and “kids won’t relate to it”. Funny, the things that adults think kids need. Thanks so much for the discussion and encouragement! What a great post – thank you for sharing. It is always inspiring to see the work and development of other illustrators. 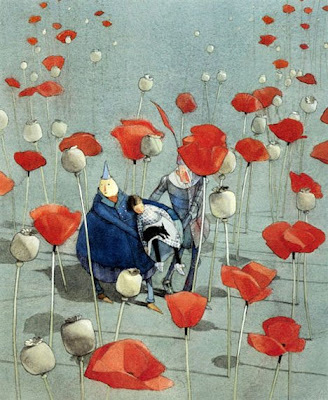 It makes me feel I am not alone/crazy for aspiring to be the best children’s book illustrator I can be! I love your darker, literary work too! Thank you Liesl! You are not alone, and you are NOT crazy!! I felt that way until I connected with the SCBWI community. Then, not only did I know I wasn’t alone, but I also knew it was a real goal that I could work towards, not just a pipe dream. Thanks Eliza. This is really helpful to see the before and after, and to see the kind of changes made. I really like the piece with the boy playing cello. I am also really awed at how much work you put into working on just one piece (I saw the blog entry about the model you made for it for lighting). You remind me not to be lazy and draw just what I can but to push myself beyond that. Thank you for this comment and the compliment, Alice! “You remind me not to be lazy and draw just what I can but to push myself beyond that.” — this is totally what I’ve been through as well. In the past, I’ve often felt that if I were a great artist I should be able to create a fantastic drawing without any preliminary work. “Let my hand create magic on the paper without need for sketches, or erasing, or work.” Of course, this is totally ridiculous! It took a lot of failed drawings to realize that the prep work I did ahead of time (collecting research, inspiration, sketches, color, tone, perspective and lighting studies), created better drawings. Though, all that said, it’s also important to try to keep the energy of your original sketch and idea. It’s a delicate balance, and a lot of work to achieve – for me at least. Good luck in pushing yourself to the next level! Not be lazy and not be scattered. So hard but so true. Great post, Eliza, and I am looking at this three years later. But I remember seeing your portfolio at the SCBWI National Conference. Beautiful work! Very interesting and insightful post, thanks for sharing this! I’m so glad you think so, thank you John! Congratulations, Eliza! Thank you for sharing your thoughts and journey. Very inspiring. Thank you Barbara! It’s awesome to hear that this has been helpful to others. So great that you were at the SCBWI conference, it was such an amazing weekend – I hope it was for you too! Well thank you! Your Princess and the Pea is awesome, I love the angle of the stacks of mattresses. Great work! Thanks Eliza! How very generous of you to take the trouble sharing with us. It is definitely a big help to see the differences. Now to look for quality in my own line-up objectively! Continued success with your beautiful work! Thank you Terry! I think objectivity is so difficult, but if you can step aside and let the work tell you what it needs, it’s definitely worth the pain! Good luck with your work! What an important post. Thank you for sharing. The anxiety about what to put in is stressful for me. I love how you have thought it totally through, while maintaining your lovely voice. Thank you for the sweet comment Lois! Maybe it would help not being stressed by remembering that you can change it at any point, viewing your portfolio as only an evolving representation of your body of work. I met you at the SCBWI portfolio reception at the National Conference, but I’m sure you have no memory of it since it was directly following the announcement that you had won. This was a very informative post. Since I am a visual person, it is always helpful when someone can explain to me what they mean through pictures. In addition to your exquisite illustration work, this is just another example of why you were meant to be a children’s book illustrator. Best of luck in all your endeavors. I do remember meeting you Mary Ann, though I had to see your picture on your blog to know for sure, since I can remember faces (but not names for the life of me). You have a very inspiring career, I’m so glad that we connected. I’m happy to hear that you liked this post, thank you so much for letting me know! I hope your career continues on in it’s successful path, I’ll be following your future blog posts. Best wishes. Eliza, what a lovely, generous post. I was moved by the powerful emotion in some of the images and how you delivered them with such tenderness. That’s the cherry on top in illustration by my measure. Congratulations! I’ve no doubt you’ll receive many more awards. All the Best! Wow Gillian, thank you so much for saying so. All the best to you as well! Way to go Eliza!!! So happy for you and thanks so much for sharing. Loved your thoughtful “interpretation” of the critiques you received. Not always easy to read between the lines. I agree, do what you love and you’ll be a winner. Thank you so much for the comment Kat, sweet of you to say so!! Very helpful! Thank you for sharing. Your welcome Kate, so glad it was helpful! Thank you everyone for such wonderful comments and encouragements! For those who might be interested, I posted a follow-up to this post about my book design. Well done, Eliza! Sharing all of your experiences with the Mentorship and Big Win , advice on creating great work and a stellar portfolio is really a gift to those of us who are trying to learn what works! Please keep it up! Thank you Michael! I’ll continue to share as I go, it’s motivation to know that I can help others learn as I do too. Keep up the great work! Interesting post! For some reason I didn’t know that I was “allowed” to repeat work that I had put in the showcase last year, so I had an entirely new portfolio this year. It reassures me that you can keep some work in, if it works with the portfolio as a whole. Thanks so much for sharing! Yes! I’ve heard that asked before, but you don’t have to re-do your whole portfolio. You could, if you wanted to, keep it the same forever (though that would be a pretty bad idea). It’s an evolving thing that improves over time. Happily, Jessica, all that work you put in for the showcase this year paid off. Congrats! 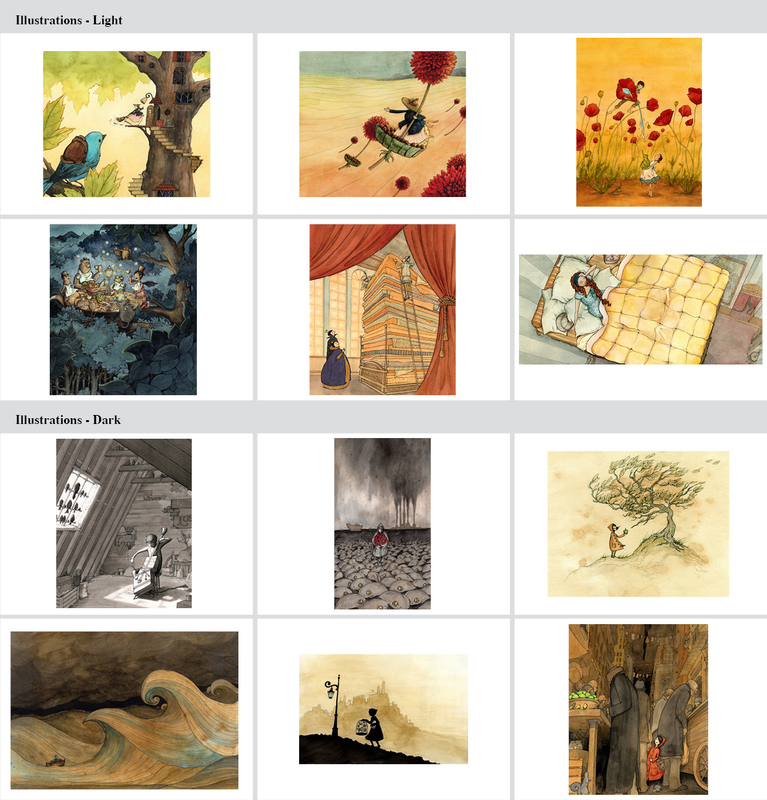 I am about to go to my first SCBWI conference in Western Washington, and trying to pull together a portfolio. So your post has been extremely helpful, especially your self-critique of before and after. I am all-over-the-place in style too. Alas, that is where I am at right now. Your most compelling images for me are the one of the child in the attic with the birds for an audience and the girl walking through the market stalls — both from the dark set. Hi Nancy! I’m so glad to hear that this post has helped you make sense of your own portfolio. I think it can be a really hard thing to pick one direction and go with it, but I think your unique voice will build and emerge over time. You have to go through this process in order to get there, so don’t force it if you don’t have to. Your work is beautiful, and I think you’ll find yourself at home among friends at the SCBWI conference. Good luck, and have fun! Just stumbled on this post at a time I most needed to hear this. Proof that good advice never goes out of style, even 2 years hence. I remember your work from the showcase that year– who could forget that beautiful Princess and the Pea image? Portfolio editing is a difficult task when one’s style is varied; you’ve just made it simpler for me. Thanks so much for sharing the feedback. Your art is GORGEOUS. Hi Jen, thank you so much for such sweet comments. I’m really happy to hear that this post was helpful for you! And your work is just FABULOUS! Keep making awesome pictures. I revisited this very useful page to recommend it to two new contacts I made yesterday at Art Directors Day (11/9/2013) who asked me about what to do about their portfolios as they were somewhat discouraged about their own presentation. So another thanks for sharing and for continued inspiration with your images. This is so awesome to hear, Terry. I never would have thought my own portfolio journey would be this helpful to other illustrators! Thanks for letting me know it has been. Lovely post and artwork – I love how cohesive your portfolio looks afterwards. Thanks so much for the tips! Eliza, I first noticed your name when I checked out “The Grudge Keepers” from the library, and from that time, I have looked for your illustrations. Your posting of these two periods of portfolios is very helpful, as I recently had a critique by E.B. Lewis and he encouraged me to follow my more realistic, loose, friendly watercolor style. When I did that picture, I initially thought it turned out terrible, as it was the first time I had worked on hot press paper, and I felt that I couldn’t control (bingo) it the way I wanted to. This style scares me to do, but also intrigues me as I want to be that free…I really appreciate your ‘blending’ of what you felt were your strengths. I hope to do the same with mine. I need to redo my website, and take out the stuff that just doesn’t fit anymore. Thanks. Keep up the great work. 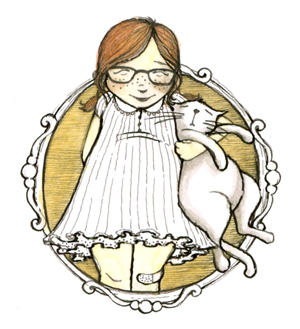 I got to your blog through Mira Reisberg’s Children’s Book Academy. Thanks for describing this how you built and changed your portfolio. It is so interesting to understand the “behind the scenes” process. I love your work! I’m so glad to hear this, Justine! Thanks so much. less cartoony and more classic look. You have a lovely style. Fantastic post! Thank you for sharing your learning process. I feel encouraged. I’m so glad to hear it, Cora!